Home » Lasagna or Lasagne – What is the Correct Spelling? If you like pasta, you probably know quite a bit about the many varieties of noodles that you can use to make pasta. Wide, flat noodles laid horizontally in layers and separated by cheese, meet, sauce, and sometimes vegetables are called lasagna. Or is it lasagne? The answer, like so many, depends on where in the world you live. 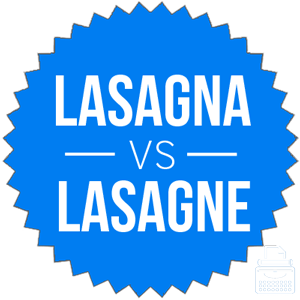 In this article, I will compare lasagna vs. lasagne. I will use each of these words in an example sentence, so you can see they should appear in context. Plus, I will show you a helpful memory tool that makes choosing either lasagna or lasagne easier every time. What does lasagne mean? Lasagne is the Italian plural for lasagna, and it is the form that predominates in British English. Lasagna, of course, is a type of wide, flat pasta noodle that originated in Italy around the 14th century. These noodles are one of the oldest known types of pasta and were probably first made in the city of Naples. Dishes that include them are typically made with layers of meat, cheese, and sauce. Hubert’s mother made lasagne for dinner, and topped it with a thick crust of Parmesan cheese. Lasagna is based on the Latin word lasanum, which is thought to refer to a type of cooking pot. Unsurprisingly, English borrowed lasagne from Italian, but not until the 1800s. What does lasagna mean? Lasagna is the Italian singular form as well as the American English spelling of the word. In America, dishes made with this type of noodle are called lasagna. The plural is lasagnas. When Catherine wanted to impress her partner with a delicious meal that was easy to make, she searched for a good lasagna recipe. These charts show the usage of lasagne and lasagna in American and British English, respectively. A clear preference for lasagna exists in American English, and for lasagne in British English, despite the fact that the noodles themselves are probably very similar. These charts aren’t exhaustive in their scope of either language community, however, since they only show usage in books published in English since 1800. Even so, they illustrate a clear trend in spelling preferences. These words refer to the same noodle and the same dishes that contain the noodles. They only differ by the language community that uses them. Americans spell the word lasagna. Since lasagna and America both end in the letter A, it’s easy to remember when to use lasagna. Is it lasange or lasagna? Lasagna and lasagne refer to wide flat noodles and the pasta dishes that are made with them. The American spelling is lasagna. The British spelling is lasagne. Other than that difference, they are completely interchangeable to English speakers. 1 What is the Difference Between Lasagna and Lasagne?